Here is some of the stuff I got. No, not all are Godzilla and Destoroyah. Part of the reason is I did so well collecting Destoroyahs that I got nearly all of them before I went to Boston. When [Michael] saw the breadth of his [Destoroyah] domain, he wept for there were no more worlds to conquer. This is Dulce's very own Godzilla collectible. 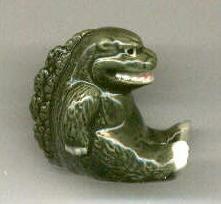 The figure is 1" hollow ceramic and depicts a cute Godzilla sitting down. She likes the feet the best. She went with me once to Creature Feature, the other time, we dropped her off at Filene's Basement. No doubt she was happier there. One Godzilla was enough for her. Ramonette, Flory, and I went to Tokyo Kid in September 2000 during my wedding week. You may recall Ramonette is the one who got my SuperWalk Destoroyah. 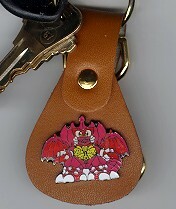 Not to be outdone, Flory got me this keychain as a wedding gift. Well, perhaps she did get outdone, but I do use the keychain everyday. 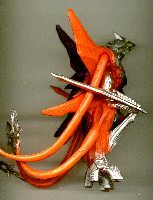 This is featured in my Misc Collectibles. You can see Dulce and my wedding page at www.dulcemichael.com. Fabian actually made these. 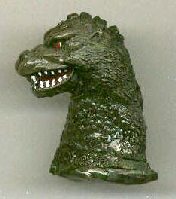 He took a Godzilla figure, made a mold, then painted it and stuck it to a magnet. This particular one is Bandai's 1991 Ghido-Goji Godzilla. Known as the "closed-mouth Godzilla", it is prized among collectors. Now I have part of one!! When I went back in October, I got a magnet featuring the GvD artwork poster. One of my favorite parts of Creature Feature is the dioramas full of loose Godzilla figures. 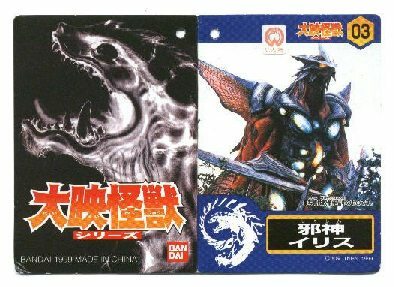 The two on the left are from a Yutaka GvD set. On the right is the 1995 Yutaka 4" Destoroyah. These are featured in my Figure Collection. This Bandai set came with twelve 2" fairly detailed monsters and yummy ramune!! Assembling them made the plane ride home a joy! These are featured in my Candy Toy Collection. This Banpresto toy was made with the collectors market in mind. What else can you do with it? Nothing is posable, and he's attached to a stand. 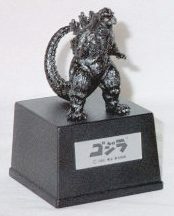 This makes him the perfect Godzilla for the office. The plastic has a metallic look to it, and the plaque is metal, making it look really attractive. With its design, it helps fight the temptation to play with Godzilla while at work, a plus for all bosses of Godzilla fans! Alas! I fell into the hype, I'm on the Gamera 3 bandwagon. But it was only $14, and I do think Irys looks really cool. Since everyone is ignoring the flying turtle in his 1999 movie, I just make him fight Godzilla (the size is compatible with the 6" Godzilla Island vinyls). The Kaiyodo one was simply awesome, with terrific coloring and detail. However, for $40, I was able to restrain my lemming instincts. 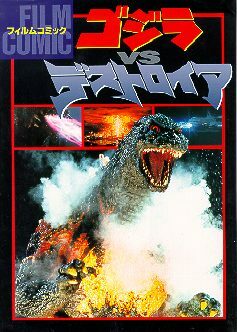 Godzilla vs Destoroyah Film Comic: Graphic novel adaptation, but with photos rather than drawings. 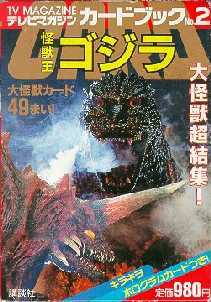 TV Magazine Card Book #2: 49 postcards of all the Toho kaiju. These are featured in my Book Collection. How could I forget this? 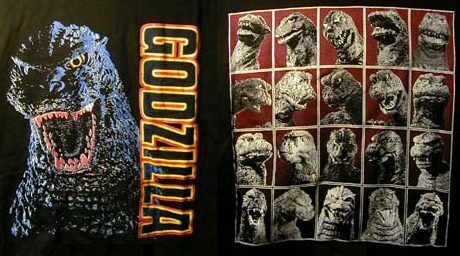 From Japan, this black t-shirt has Godzilla's face on the front, certainly the pinnacle of fashion. 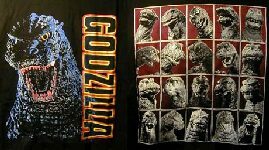 20 different Godzilla heads are on the back, from his various movies. Ralph Lauren, eat your heart out! When I went back to Boston in October 1999, I picked up Gamera 3 from Creature Feature. While I did like the effects, I thought the lack of monster action hurt the film. On the whole, I found Godzilla movies more enjoyable (which I personally consider the most important factor in judging kaiju eiga). Go Back to Collection Page.